Four days into the worst snowfall London has seen in a generation and I found myself slip-sliding my way down an insalubrious street in a dark corner of Shepherd’s Bush. The end of the street led to an unlit car park and if it wasn’t for the groups of twos and threes that were also making the same journey – a casual observer might have thought we were convening for a swingers’ party – I’d have wondered if Google maps had taken me on a wild goose chase. On the first Thursday of most months, The West London Fantastic Film Society meet in the preview theatre of a cinema equipment company in W12 to show double bills of classic and not so classic B-movies. The first screening of 2009 included Panic in Year Zero (1962) and The Colossus of New York (1958), two films I’d never even heard of before and enjoyed considerably. Previous screenings have ranged from the ridiculous (The Creature Walks among Us) to the sublime (The Exorcist) and it is this disparate programme, which mixes forgotten gems with masterpieces of the genre, that guarantees that a small but loyal membership keeps returning. As the number of art-house and niche cinemas continues to dwindle throughout the UK, and in London in particular, clubs like the WLFFS provide the only opportunity for fans to see older movies that are not considered worthy of showing at the venerable BFI. While the internet (both legally and illegally) has made thousands of forgotten films available again, watching a DVD at home, no matter how impressive your home cinema system, is not quite the same as seeing a celluloid print of an obscure movie projected with a group of like-minded individuals. It is this, as well as the eclectic programme, that will ensure the club’s survival. 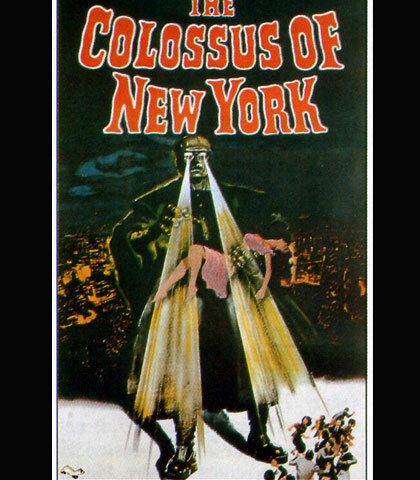 Neither Panic in Year Zero nor The Colossus of New York is a cinematic masterpiece. The former contained about 20 minutes of monotonous footage of cars on tarmac and a soundtrack of relentlessly cheerful lift music that might drive casual viewers to distraction. But the gonzo pairing of teen idol Frankie Avalon and B-movie stalwart Ray Milland in a film that has a nuclear war going on down the road while the cast goes camping made for diverting viewing. The latter film – a fun robotic take on the Frankenstein myth – was far more engaging and had a terrific mechanical monster that shot beams out of its eyes. However, The Colossus suffered from the same problem as the risible Friday the 13th Part VIII: Jason Takes Manhattan (1989): New York was represented by a few brief shots of stock footage and anyone expecting a space age thematic sequel to King Kong got their monster movie thrills in word rather than deed. But where else could you see these films projected on a cold dismal night in February while being able to buy popcorn and hotdogs for less than a pound? The main films, one of which is occasionally swapped for an episode of The Twilight Zone or a related documentary, are accompanied by support material. When I attended, the strange double bill of caravan apocalypse and robot brain transplant was preceded by an old newsreel documentary about kamikaze pilots during the Second World War. Later, and better still, the interval was prefaced by old 1950s and 1960s cinema adverts that were terrific to watch for both nostalgic reasons and for the juxtapositions of theme and product that seem both charming and strange to modern eyes. The WLFFS experience also involves a swap shop for Italian exploitation DVDs (starting at Ã‚Â£2.50) and a lovingly produced programme full of stills and original poster art that even includes a reproduction of the original foyer material for one of the films, printed on card as a brilliant keepsake. The WLFFS is attended by both fans and retired film directors. It was fantastic to have my hotdog served by Norman J. Warren, the director of Satan’s Slave (1976) and Inseminoid (1981), and his apology that Panic in Year Zero was being shown in the wrong aspect ratio was both charming and unnecessary. Norman and host Darren Perry source the films from collectors’ fairs and in fact had shown both of these titles in ‘inferior’ prints at screenings earlier in the decade, but finding better 16mm copies and an increase in members’ numbers justified a repeat showing. Another, equally unnecessary apology came from the woman sitting behind me who said, ‘the interval can tend to go on a bit long as everyone likes to catch up, but Darren does try to make sure everyone is able to get the last train home’. I first met Darren and Norman at another small film club in Croydon, which was in a cosier venue still, as the host projected films from his kitchen (through a hole in the sliding doors) into a screen in his living room and served nibbles in the garden. If Mike Leigh had directed an episode of Spaced, I suspect it would have been not dissimilar. At one of these nights, as the interval’s cheese and pineapple on sticks was followed by a darker horror film for the second part of the double bill, the host suggested to his aunt who was sitting in the back row that she might ‘want to sit that one out as it was a bit bloody’! Darren also volunteers as the projectionist at the Gothique film society, which meets once or twice a month at Conway Hall in Red Lion Square (next screening: Captain Kronos, Vampire Hunter) and attracts some of the loyal band of WLFFS aficionados. However, there is nothing cliquey about these affectionate, welcoming groups, which are always delighted to have new members. Film journalists at major publications regularly bemoan the disappearance of the cult screenings at the Scala in King’s Cross, but these screenings are still taking place. These days you might have to travel outside of zone 1 and wrap up warm in a cold warehouse in Shepherd’s Bush or squeeze into the front room of a semi on the A215 to Norwood, but that’s a cinematic experience as worthy as anything mainstream critics remember with rose-tinted spectacles. The next WLFFS offers the unexpected juxtaposition of Yoko Tani as ‘the Leader of the Lystrians’ in Invasion (1965) with David Cronenberg’s perennial head-exploding classic Scanners (1981). Freak weather notwithstanding, I for one will happily be making the trip. Contact Darren for more info about the WLFFS – Ã‚Â£6.50 for guests / Ã‚Â£15 membership and Ã‚Â£4 tickets if you join – on filmhorror (at) yahoo (dot) co (dot) uk. For The Gothique film society, visit thegothiquefilmsociety.org.uk. Hello to all in The West London Fantastic Film Society! Cheers! We hope to see you there folks!